I provide a definition for "Friendship Evangelism," here. I explain why I believe "Friendship Evangelism," as it is most commonly practiced, is neither friendship nor evangelism, here. I explain why I believe random or planned acts of kindness, without the proclamation of the gospel, are not evangelistic endeavors, here. And I provide an example of how proponents of "Friendship Evangelism" perform eisegesis upon Scripture in efforts to support an unbiblical philosophy of ministry, here. There is much more that I have written regarding "Friendship Evangelism." It's no secret that I am an outspoken critic of "Friendship Evangelism," as it is most commonly practiced. I believe it is an exercise of self-love and self-preservation. And I believe most strategies designed to help Christians engage in "Friendship Evangelism" have, as their primary (albeit unwritten and maybe even unintended) goal, protecting Christians from persecution and not reaching the lost with the gospel of Jesus Christ. Something struck me not long ago--something I had not previously considered--something that has caused me to dig in my heels even deeper against "Friendship Evangelism." 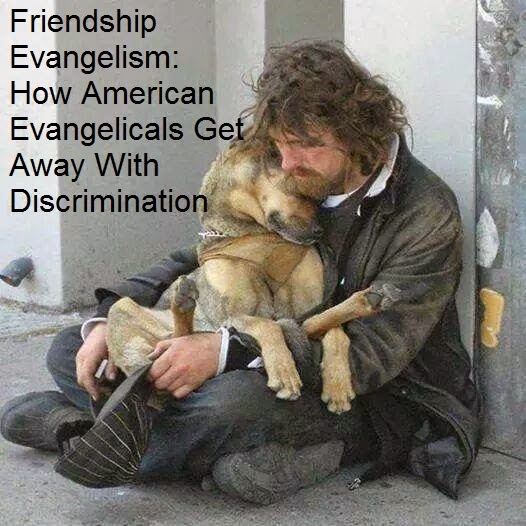 "Friendship Evangelism" is an evangelical form of discrimination. Take a good look at the man in the above picture: homeless, destitute, dirty, the only real friend he has in the world is his dog. His background: unknown. His problems, if any, with addictions or mental illness: unknown. The reason he finds himself living on the streets: unknown. A military veteran tossed aside by his country after they trained him, put him to work, and wore him out: unknown. I wonder how many Christians committed to "Friendship Evangelism" have gone to places where a man like the man in the photo lives, befriended people like him, and established long-term relationships with people like him, with a view of sharing the gospel with him. I'm not talking about spending a couple hours in a bad part of town handing out blankets and sack lunches, personal hygiene items and used clothing, and then jumping back into the church van wanting to bathe in Purell. I'm not talking about field trips to the inner-city, just to come back and testify at the next youth meeting how wonderful it felt to be used by God, or how blessed you were to feed homeless people, or how much you think you showed the love of Jesus to people you were nervous to touch. No, dear Christian friendship evangelist, I'm not asking you how many people like the man in the photo you have served. I'm asking you how many people like the man in your photo are your friends--you know: people with whom you regularly break bread or share a mocha, invite to your home, allow to drive your kids to school, or give them the keys to your house while you are away on vacation. How man people like the man in the photo knows you so well that they can tell me your life story as accurately as you can? To how many people like the man in the photo do you send birthday and Christmas cards? How many people like the man in the photo will be invited to your son's or daughter's wedding? Some of you reading this are starting to squirm. You're desperately trying to figure out how you can answer my questions honestly without making my point. Please, don't hurt yourself. The reality is this. "Friendship Evangelism" as it is most commonly practiced is discriminatory because the only people who will likely ever hear the gospel from you (if you're a friendship evangelist and you ever actually share the gospel) will be people you like--people with whom you're comfortable--people you've deemed worthy of your friendship. What about the people who don't share your love for softball, fishing, sailing, chess, video games, knitting, cooking, or any other hobby to which you devote your time? What about the people around whom you might never find yourself--people from a different culture, different social-economic status, different tier in the workforce, different color, or people whose sins you particularly loathe? What if you don't smoke? The cigar shop is likely out. What if you don't drink? The night club scene is likely out. What if you're not athletic? Cross those who spend a lot of time at the health club off your list of potential friends. What if you're not into body piercing and tattoos? Guess you won't be going to those places either to find potential friends. Well? What about everyone else? What about all those people that are nothing like you? What about those people? What about the "thems" of the world? Time to get honest my friendship evangelist brethren.....with yourself. If you are engaged in "Friendship Evangelism," in the way it is most commonly practiced by American Evangelicals, if you ever do get around the gospel, the only people who will hear it from you are the people you like. And that's discrimination. So, how can I be so certain--emphatic about the beliefs I've articulated thus far to the point of likely causing offense to some? I'm certain of what I'm saying because I see people like the man in the photo almost everyday. I do talk to them. I hear their stories. I share the gospel with them, either through conversation, gospel tracts, or while I am open-air preaching. What I don't see are the friendship evangelists out on the streets developing long-term, no-strings-attached relationships with people who are their opposites in almost every conceivable way. Now, before you try to fire the "hypocrite" round across my bow, I don't have any long-standing friendships with anyone, at the moment, like the man in the photo. But that's okay. You see: the needs of the man in the photo are so much greater than his need for my friendship. He needs the gospel. He needs Jesus Christ. He needs his sins washed away more than he needs a bath. He needs eternal life more than he needs the love of his dog or my friendship. The man in the photo needs a Christian to love him enough to speak the truth in love to him. He needs that so much more than a Christian's friendship. It's time to stop discriminating, my Christian friendship evangelist brethren. It's time to get out of your comfort zones and reach the "thems" of the world--those you might see as "the least of these." "My brothers, show no partiality as you hold the faith in our Lord Jesus Christ, the Lord of glory. For if a man wearing a gold ring and fine clothing comes into your assembly, and a poor man in shabby clothing also comes in, and if you pay attention to the one who wears the fine clothing and say, 'You sit here in a good place,' while you say to the poor man, 'You stand over there,' or, 'Sit down at my feet,' have you not then made distinctions among yourselves and become judges with evil thoughts? Listen, my beloved brothers, has not God chosen those who are poor in the world to be rich in faith and heirs of the kingdom, which he has promised to those who love him? But you have dishonored the poor man" James 2:1-6a). Excellent post. What a great point about how discriminatory it is to only evangelize people you like enough to make friends with. Although, I always sanitize after I go out witnessing, whether it is with a dirty looking fella or a clean cut person... :) Just to prevent spread of germs if I can. Can I publish this as a gospel tract for the "friendship evangelists" who approach while we're preaching and tell us why we're "doing it wrong"? Great article, brother. Thank you again.